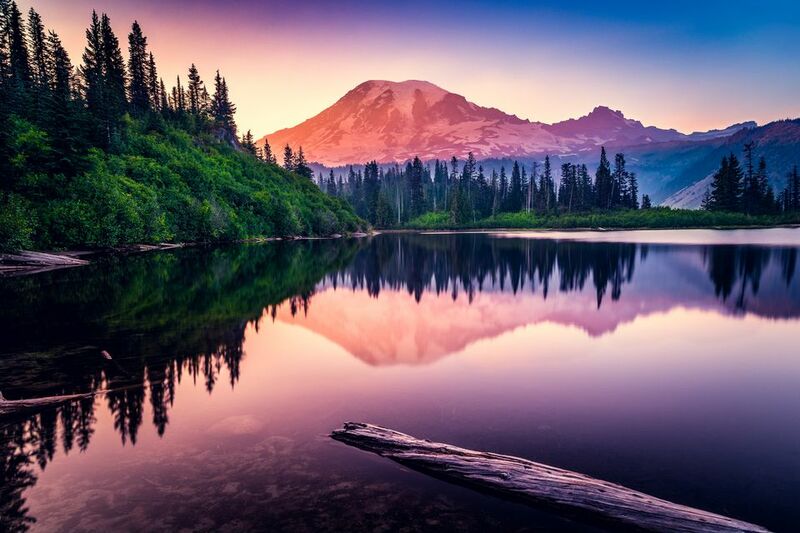 From the tallest trees on earth to active volcanoes, the Pacific Northwest is truly stunning. Here is a look at the top national parks in the region, maps, photographs, and more. It is hard for visitors to forget their first view of Crater Lake. On a clear summer day, the water is such a deep blue many have said it looks like ink. With stunning cliffs towering over 2,000 feet above, the lake is tranquil, stunning, and a must-see for all who find beauty in the outdoors. Lassen Peak erupted intermittently from 1914 to 1921 and, before the 1980 eruption of Mount Saint Helens in Washington, was the most recent volcanic outburst in the contiguous 48 states. Active volcanism at Lassen Volcanic National Park includes hot springs, steaming fumaroles, mud pots, and sulfurous vents. This greatest single-peak glacial system in the United States radiates from the summit and slopes of Mount Rainier, an ancient volcano. The 14,410' mountain is surrounded by lush old growth forests, subalpine meadows, and a National Historic Landmark District that showcases the log and boulder buildings typical of the "NPS Rustic" style architecture of the 1920s and 1930s. Sitting deep in the wild northernmost reaches of the Cascade Range in northwestern Washington, it is flanked on the south, east, and west by national forest lands and on the north by provincial lands of British Columbia. The national forest lands feature outstanding federal wilderness areas including Glacier Peak Wilderness on the Mount Baker-Snoqualmie and Wenatchee national forests. Olympic National Park encompasses three distinctly different ecosystems—rugged glacier-capped mountains, stands of old-growth and temperate rain forest, and more than 60 miles of wild Pacific coastline. These diverse ecosystems are still largely pristine in character (about 95% of the park is designated wilderness). The park encompasses more than 922,650 acres and receives more than 3.3 million visitors per year, ranking it as the 4th most popular national park in the United States. Comprising 45 percent of all the old-growth redwood forest remaining in California, this park - together four other parks in California - are a World Heritage Site and International Biosphere Reserve. The ancient coast redwood ecosystem preserved in the parks contains some of the most majestic forests scenery anywhere in the world.